After the devastating 2017 hurricane season in the Caribbean basin and Gulf of Mexico with estimates of 63,000 boat destroyed or damaged, many boaters are thinking about safety related to tropical cyclones. French Polynesia was for many years considered to be relatively safe from tropical cyclones, for instance the well respected Bowditch’s American Practical Navigator placed it outside the cyclone area. These perceptions changed abruptly during the 1982-83 El Nino season when five cyclones passed through the Societies and Tuamotu Islands. 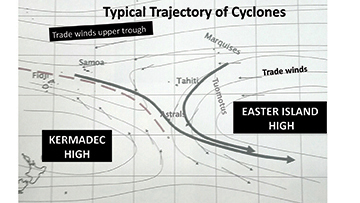 To obtain a reasonable understanding of cyclones in French Polynesia, several factors are important to review: the patterns of these revolving tropical storms; the measurement scales used in different areas; the very marked impact of the El Nino cycle; and, in comparing cyclones (hurricanes) incidence to other cruising grounds, the ocean temperature data and geography come into play. The following review will focus only on cyclonic storms with wind speeds above 64 knots. Also, as it is the nomenclature in the Southern Pacific basin, the term cyclone will be used for ‘revolving tropical storms’ rather than hurricane or typhoon. 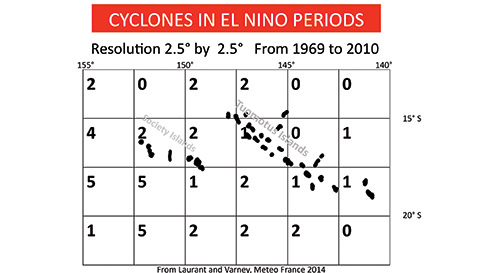 When reviewing information regarding cyclones regional differences in record keeping are important to understand. Scales for cyclones are different in the Pacific than the more common Saffir-Simpson scale used in the Caribbean. For the purpose of this article, the wind velocities are converted to Saffir-Simpson scale and only storms of 64 knots and above are reviewed. Tropical depressions can produce distressing and worrisome situations but should not pose the risks to life and vessels that are associated with cyclones. French Polynesia has five separate island groups that collectively take up an area almost the size of Europe. The Marquesas have had no reported cyclones with winds above 64 knots and therefore are safe from cyclones. The Gambiers, which are in the south-eastern corner of French Polynesia, are generally safe from hurricane force storms. The Austral Islands are most at risk for cyclones due to the pattern of cyclones in the region, which is discussed later. Finally, the Society and northern Tuamotu Islands comprise the majority of the cruising area for sailing yachts in French Polynesia. As will be discussed later, these two archipelagos are at some risk but generally only during the El Nino cycle. 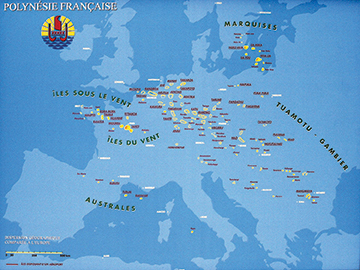 The Societies are also known by their French names, Iles du Vent and Iles Sous Les Vent. As a cruising ground French Polynesia has distinctly fewer cyclones than the rest of tropical South Pacific. The question on many people’s mind this year is: “Is it safer than the Caribbean?” The short answer is much safer but examine some of the data yourself. One of the main factors that influence tropical storms in French Polynesia is the cooling effects of the Humboldt Current. It is the fluctuation of this cold current traveling up the west coast of South America which is primarily responsible for the El Nino / La Nina cycles. In fact, the temperature in the ocean near French Polynesia is the basis for determining the El Nino/La Nina index. 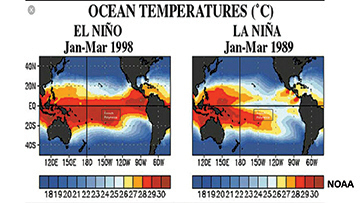 Hence, the El Nino condition involves the waters in French Polynesia becoming warmer (more red in illustration A). Warmer ocean temperatures are conducive to the formation of cyclones. It is therefore no surprise that the generally cooler Eastern South Pacific around French Polynesia has far few cyclones than, say, the Caribbean. Much of the data in this article is derived from research by two French meteorologists, V. Laurent and P. Varney, and uses meteorological data collected between 1969 and 2010 for all of French Polynesia. This article focuses primarily on the Societies and the Tuamotus. French Polynesia is affected by two separate patterns of cyclones: the south easterly moving storms and the “recurving” storms that begin forming near the Marquesas and steer southwesterly before recurving to steer southeasterly. Most cyclones in French Polynesia arrive from the west via the Cook Islands, usually passing south of the Societies but more regularly passing over the Austral Islands. This pattern is seen in all three climate conditions ( El Nino, Neutral and La Nina.) 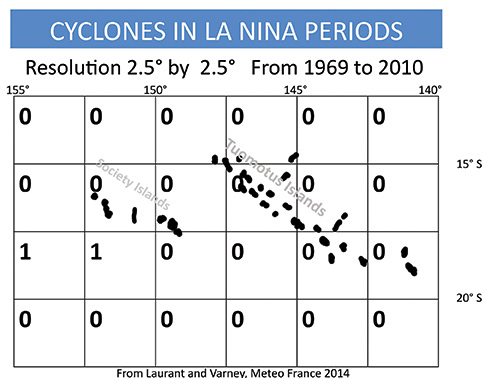 The recurving pattern is common primarily during the El Nino cycle and generated the two strongest storms recorded for French Polynesia. Satellite imagery of big Caribbean hurricanes suggest that cyclonic tropical storms create an area of extreme danger, which reaches hundreds of miles from the eye. In fact, the hurricane force winds generally do not extend more than 50 miles from a storm’s center. Those familiar with hurricanes in the Caribbean will know that despite numerous hurricanes passing near to Trinidad, the island remains a safe zone. In applying this proximity factor to French Polynesia, the typical Category 1 cyclone must pass very near to an island to create more than gale force winds. The El Nino / La Nina climate condition is today based on ocean temperature. Originally, it was based upon barometric pressures but more accurate water temperature measures have been the basis of the ENSO or El Nino Southern Oscillation Index. This more accurate data came into usage in the 1960s. To best demonstrate its impact on cyclones in French Polynesia, two authors from Meteo France, Laurent and Varney, measured the passage of cyclones through areas 2.5 degrees by 2.5 degrees or 150 nautical mile squares. 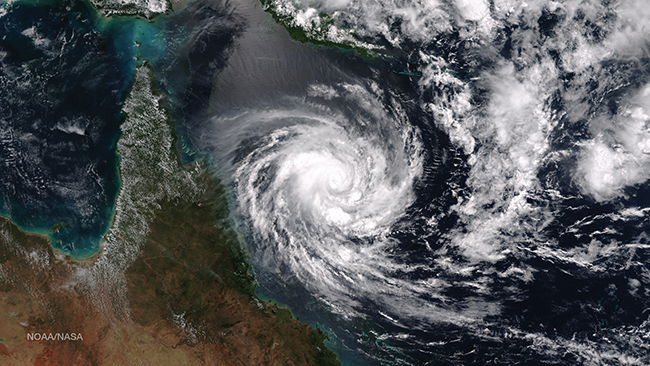 All cyclones from 1969 to 2010 were grouped into the three different climate conditions. For our purposes, only the areas surrounding the Societies and northern Tuamotus (as far south as Hao) have been included. A further analysis of the data shows there were 13 cyclones in the Societies and Tuamotus over a period of 41 years but only in seven of the 41 summer seasons did cyclones pass within 300 nautical miles (five degrees) of the Societies or the Northern Tuamotus. Only two cyclones occurred outside of El Nino conditions, which passed within five degrees of the Societies or Northern Tuamotus. These two passed over a 100 nautical miles from these islands, resulting in below hurricane strength conditions but they did produce waves well above average. In short, except in El Nino years, the likelihood of hurricane force winds in the Society, Tuamotus or Gambier Islands is very low and in the Marquesas non-existent. Television images of Category 5 hurricanes in the Gulf of Mexico such as Katrina or Harvey leave the perception that all hurricanes produce extreme tidal surges. Two factors produce tidal surge: very low barometric pressure and shelving shorelines. Barometric pressure has a relatively small effect compared to shoreline geography. The Societies and Tuamotus have no continental shelf and fringing reefs generally have precipitous cliff edge drop offs. So, tidal surge is much less of a consideration than might be anticipated. In considering French Polynesia as a cruising ground one conclusions is that during an El Nino period a careful owner would consider taking his or her vessel to the Marquesas, hard standing their vessel at one the five boat yards in the Societies or Tuamotus or consider hunkering down in one of the four hurricane holes on Tahiti, Raiatea, Taha or Bora-bora. From a metrological standpoint, specific cyclones are difficult to predict. In the Caribbean and continental North America, forecasters generally attempt to predict how many named storms will occur in a given season. French Polynesia is a different kettle of fish since prediction depends strongly on one factor, the El Nino condition. Over a 66-year period, only one in four of these (southern hemisphere) summer months had an El Nino condition. Another way to look at the El Nino effect is to quantify the summer months with El Nino conditions in at least one month, which accounts for 20 seasons in the past 66. To put this information into a cruising plan, approximately one in every four southern hemisphere summers it might be wise to choose to hard stand your boat or to sail to the Marquesas. We have found fees for hard standing comparable to those in the Caribbean. So back to the question of French Polynesia compared to the Lesser Antilles in the Caribbean. In the Societies and Northern Tuamotus, 13 cyclones were recorded in or near the region from 1969 to 2010. 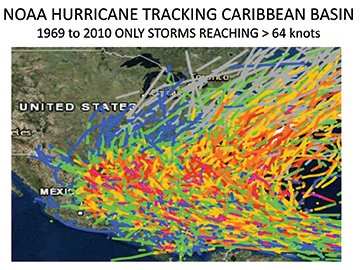 In the North Atlantic basin during the same time frame there were a total of 286 hurricanes, the majority of which passed through the Antilles (see illustration B). Safe areas in the region of French Polynesia include the Marquesas and the Gambiers; the Caribbean has Trinidad. With regards to storm intensity, Caribbean storms are far bigger on average; FP had only four storms greater than Category 2 in 40 years, which would not even compare with just 2017 in the Caribbean. Predictability and the ability to plan ahead in French Polynesia is rather special in this regard with its very strong linkage to El Nino. 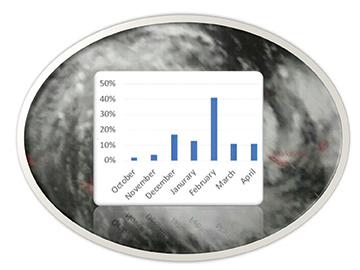 Monthly reports give strong prediction data well ahead of the cyclone-prone months. Another factor to consider is the sheer volume of boats in the Caribbean which makes spectacles like the boat bomb in Paraquita Bay in the BVI’s or St Martins Lagoon much less likely in FP. For many sailors, like myself in 1998, French Polynesia was just a beautiful stopping off place on the long path of a circumnavigation. But for me today it also represents the best trade winds-based tropical cruising grounds left, with its (still) healthy coral, friendly, welcoming people, good infrastructure, uncrowded anchorages, very low crime rates, excellent health care facilities, stunning landscapes and vibrant culture. In addition to all these advantages, the French Polynesian cruiser will be confronted not only with many fewer tropical cyclones but can much more readily predict the possibility of a cyclone during the summer months than is possible in any other tropical paradise. Sailing has been a part of John Freeland’s life for 59 years. Over the past 31 years, he has cruised extensively and made a circumnavigation aboard Mary Ann II, his beloved Westsail 32. Since 2010 John’s wife, Julia and Murphy, their King Charles Spaniel, have cruised the Med, the Caribbean and now the world’s best tropical cruising grounds, French Polynesia.